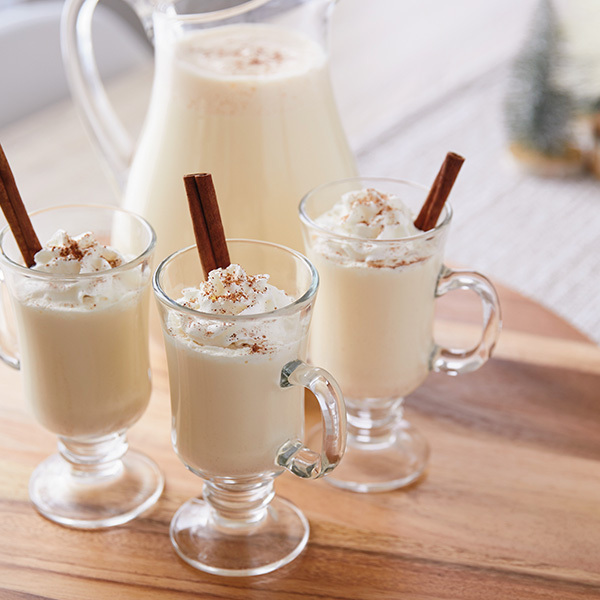 There are several variations to this eggnog punch, allowing you to customize it to your taste buds. We started with even proportions of eggnog, ice cream, and soda, leaving the alcohol out so guests can add their own. For a thicker, richer punch, up the amount of ice cream or eggnog. For a lighter, fizzier drink, use more soda. Combine the ice cream, eggnog and soda. Adjust proportions until you like it. Stir and keep chilled until serving. Serve with a dollop of whipped cream and a dash of nutmeg. Ginger ale gives the punch a hint of spice. Lemon-lime soda makes it tangier. Cream soda doesn’t really add any new flavor. Bourbon, whiskey, and rum are traditional favorites in eggnog. Amaretto is surprisingly yummy (and decadently sweet). Anyone who loves eggnog lattes will love eggnog punch with a shot of coffee liqueur.